Coil Master DIY Mini V2 KitCoil Master DIY Kit Mini V2 is the simplest version of DIY Kit. The .. Coil Master DIY Mini KitCoil Master DIY Kit Mini is compact and outdoor-friendly building kit for va.. Coil Master B2 & B4 18650 Battery CasesThe Coil Master B2 and B4 battery carriers are protective.. Coil Master 521 Mini V2Also driven by a single 18650 battery, Coil Master 521 mini V2 is a handy com.. Coil Master SkynetThe Coil Master Skynet coil case carries 8 different.. Coil Master 521 Plus TabThe Coil Master 521 Plus Tab is a totally redesigned and multi-functional de.. 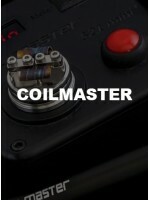 Coil Master Ready BoxSpecifications:6 x Coils6 x Cottons1 x User ManualWeight: 54gPackaged in Tin Bo.. Coil Master Vape BrushCoil Master Vape Brush is a multi-functional tool dedicated for DIY vapers.Wit.. Coil Master Vape TweezersCoil Master vape tweezers are revolutionary and multi functional tools for .. The newest Coil Master DIY Kit V3 is a perfect all-in-one kit for DIY users. All tools are High-Qual.. Driven by a single 18650 battery, Coil Master 521 mini Tab is a handy compact device for vapers. It .. Coil MasterKanthal A1 Wire30Ft RollsAvailable in:24,26,28 AWG.. Coil MasterStainless Steel316L Wire30Ft RollsAvailable in 24,26,28 Gauge..
Coilmaster 521 TabFeatures:Ohm MeterVoltage meter for Mec Mod/Regulated MODCoil rebuilding deckCoil .. Coil Master Organic Cotton(5pcs/pack)Color:milky white with black spots (cottonseed or shredded leav..